The Steam Machines installation was a piece using multiple steam powered noise generators. The idea was to set these running in the space progressively until 20 of these devices were operating simultaneously creating a cacophony of belches, wines and squeals. There was to be a performic element to the piece as myself and Stef Wyke would be in the space setting up and maintaining the machines over a duration of five hours. Realizing the work produced to some interesting effects and raised certain issues. Firstly it became apparent quite quickly that this was more intensive work than first thought. Once more than 6 had been established it became difficult to maintain constant noise from all machines. It is there nature to be chaotic and this is part of their charm for me, but they are too unreliable and need constant attention. This highlighted the performic element of the work. I felt as if we were maintaining some kind of factory, working with the devices produced soot which got onto our hands and clothes. Also the smell of the warm rubber and charring cans made me think of the odours associated with industrial processes. We were assembling the machines in the space as well which had notions of a manufacturing line and I began by "training" Stef in how to produce the devices. After five hours (with lunch break) we both felt exhausted due to the amount of concentration and constant maintenance required. As a primarily sound based artist I often overlook the visual element of my work. To me the noise machines are a means to an end, how they look is a consequence of their function. Visitors to the work seemed to find the objects visually interesting in their own right, comments were made about there resemblance to something insectile due to the wire legs I had given them to place the candles under. Sculpturally too, they had an impact, particularly when they were producing rhythmical motion. 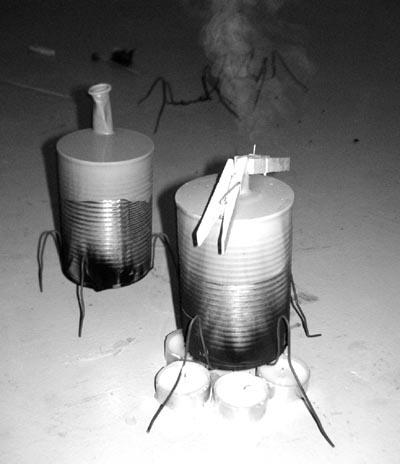 How they worked in the space was also interesting, to me it seemed as if they were invading or intruding. After the installation I felt it had been a successful experiment, although I was a little disappointed by the sound element. I really wanted to create this din of flatulence but it was not intense enough for me, it was more a background environmental ambience much like bird song or insects. Once I had gone through the documentation, I felt better about it. There was a lot going on, however at the time I was busy concentrating on maintaining and creating the machines, than listening to what was actually happening. Feedback I received from the event was very positive people like to spend time in the installation, wandering around and finding particular machines that were their favourites. This anthropomorphic quality is something I find really intriguing. I would like to do this again in another space with more performers. In particular I would want to pursue this idea of factory process. Maybe include other devices or sound producing actions. An environment which could be explored with no central focus but areas of activity. Part installation; part performance. I also feel the steam machine is developed enough at this stage to become part an arsenal of sound producing devices at my disposal.